ROARING FORTIES™ RS400 series Type 3 PFD for Child and Adult is a middle range PFD Type 3 for skiing. It has a 4 straps buckle system. 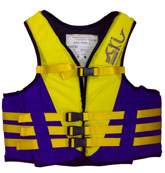 This light weight PFD holds well to the body with the 4 buckles system.